At its heart, Giving Tuesday is about making an impact. I’m proud that at Harlem United, we evaluate every program’s impact to make sure that we accomplish what we set out to accomplish. Today, I want to share more about one aspect of our work that makes us unique. By supporting current and former drug users in making healthy decisions for their lives, we choose to meet them where they are. We know not every drug user is ready to stop right away which is why we offer an Integrated Harm Reduction Program for active users and robust Recovery Support Services for those who are ready to stop using. There’s a human element that goes along with every program, but there are also some hard numbers that really show you the breadth and depth of the impact that this program is making. Our harm reduction program served over 700 clients in the past year. Many of these clients come first to get clean needles and continue on to receive education, testing, medical services, counseling, and more. We spent over 2,000 hours out in the field literally meeting clients where they are to get them the services they need. 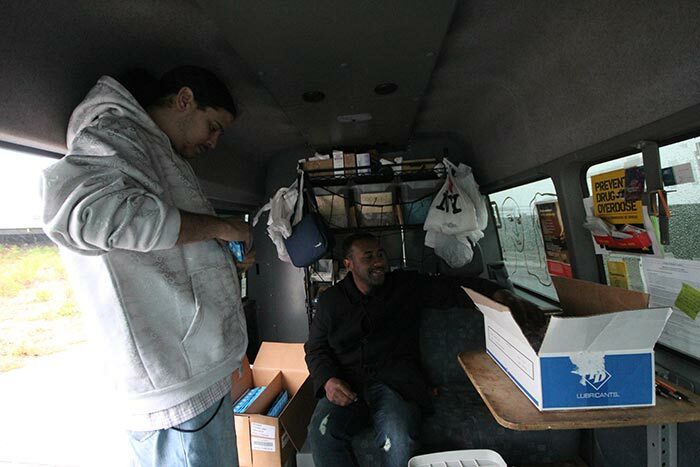 We gave out 241,000 clean syringes and collected over 125,000 this year. Giving out clean syringes plays a large role in reducing HIV transmission and preventing other health issues associated with using old or dirty needles. Cities with syringe exchange programs, including New York City, have seen HIV rates among users drop by an impressive 75% and at least $180,000 is saved for every new HIV infection that is prevented through this program. Over the next few weeks, I’ll share some personal stories that bring to life the personal and community transformation behind these numbers. Today though, I want to make sure that you know when you give to Harlem United, you are part of an effort that makes a huge impact in New York City. No Replies to "Make an impact with us on #GivingTuesday"